In response to overwhelming demand, we now manufacture a full range of MDF Skirting Covers, (or ‘skirting over skirting’ as it is sometimes called). 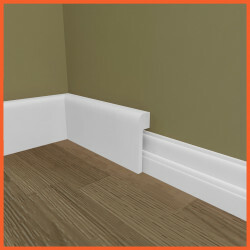 A skirting board cover looks exactly the same as a regular skirting board, but is manufactured in a way that allows you to fit it straight over your existing skirting board without the need to remove what is already there. If you remove your existing skirting boards, you risk damaging the surface of your wall, which could take time and money to repair before fitting new skirting boards. Fitting a skirting board cover eliminates the need to remove your existing skirting board, saving you time to spend on the things that are important to you. 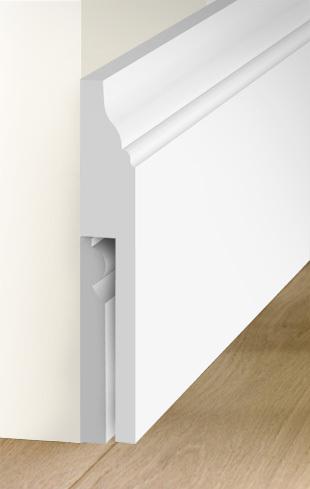 We manufacture skirting board covers for a small additional cost, which is MUCH LESS than it would cost if you had to repair damaged plaster, or pay a tradesman to remove your old skirting boards. 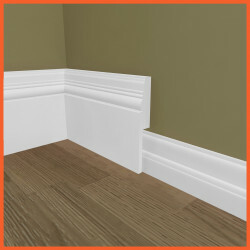 Fitting a skirting board cover gives you the opportunity to hide any visible cables (telephone wires etc) at the same time as covering your existing skirting board.